Nena – 99 Red Balloons – Official Music Video. 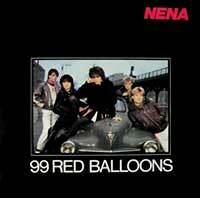 German version “99 Luftballons” appears on Nena’s 1983 self-titled album. An English version written by Kevin McAlea in not a translation of the original German version and contains somewhat different lyrics (the band and Nena herself were quoted as being “not completely satisfied” with the lyrics of English version). 99 Red Balloons reached number 1 on the official singles chart in the UK, Ireland Canada in 1984.